Inside: Discover seven effective ways to get your toddler to bed with no excuses. Toddlers are smart little humans. By the time children are two-years-old, many have figured out exactly what to do or say to stay awake at bedtime. Parents of toddlers know that they are notorious for creating a plethora of excuses to stay up. “Just one more drink,” they plea. “One more song, puh-leease?” they beg. They might even try the divide and conquer method, “Mom said I could read one more story.” And who can really blame them? But at the end of a long day, parents need some time to recharge and rest. Become a bedtime guru today and get your toddler to bed with no excuses. Set aside time for your toddler wind down before bedtime. Ideal, low-energy activities for this time are things like reading books, putting together puzzles, or talking. This winding down time is important for toddlers as they prepare for bed. By providing time to calm down, parents are helping to create a successful experience for their child. Each child is different, so the length of time parents provide to calm down will be dependent upon the child. A good starting point is 15 minutes. Then, parents can adjust the time as needed. Provide plenty of time for your child to complete the bedtime tasks at a natural pace. 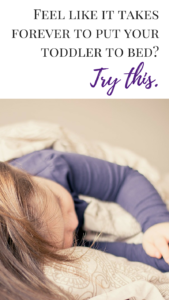 This will help to maintain the low-energy vibe and prepare your toddler for bed. If you find that you are typically rushing through the bedtime routine, add a few minutes each night, until you find a natural pace. As the parent, you can pick and choose what elements work best for your family. Once you have selected the elements of your routine, stay consistent. If you do choose to include songs or books, I recommend setting a specific number for each or timer for these activities so there is a clear ending. Children thrive on consistency. They enjoy having predictability and knowing what to expect. Being consistent with a bedtime routine will help to set your child’s expectations. If your toddler knows that every night there is a rhythm, they will be more likely to follow that routine, rather than fight it. However, if every night is different, they are more likely to test the boundaries and limitations to see what each night holds. Being consistent is key to eliminating bedtime excuses. Many parents have found success putting a toddler to bed with no excuses, by using rewards. The reward can be as simple as praising the child the next morning for following the bedtime routine and falling asleep. The reward could also be as complex as giving a child a set amount of tickets each night. For each ticket, the child could ask the parent to come into his/her room. If the child decides to instead save the tickets, he/she can then turn them in for a reward. 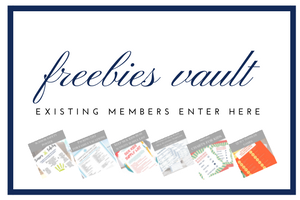 As the parent, you know what will work best for your child, so you can create a simple or complex reward for your toddler following the bedtime routine. Balance means making small adjustments as your toddler needs it. This means providing overall consistency of the routine, but also allowing space for your child’s needs. If they are sick, maybe they need to go to bed earlier that day. If they had a rough day, maybe they need extra time for snuggles or hugs. Provide time for your toddler to begin winding down before bedtime. You may begin with 15 minutes, and adjust from there. Provide enough time for your child to go through the bedtime routine at a natural pace to maintain low-energy. 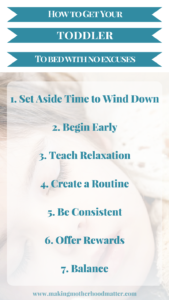 Pick a relaxation technique to practice with your toddler to help him or her begin to learn how to relax before bed. Select a bedtime routine for your child to create predictability and stability for your child. Select a bedtime routine and stick to it. You will help your toddler by setting his or her expectations and eliminate excuses. Reinforce when your child makes progress towards staying in bed and going to sleep with something as simple as praising the child for making a good choice, or create a more complex reward system of your choosing. Stick to the overall routine to provide consistency, while also considering your child’s needs. Provide some flexibility when needed. P.S. 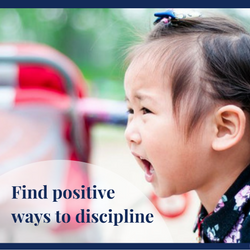 If you enjoyed this piece, you may also like the Positive Ways to Redirect Your Misbehaving Toddler. Super suggestions. It's hard but stay strong. Time passes quickly. If by early you mean 3:00 ? :} Great tips! I especially like teach relaxation. Yes, teaching relaxation is a great for helping toddlers long-term. I agree, a routine can provide such comfort. I am always happy to hear about other parents reading to their children. It is so important. Love these tips! I agree with setting time to wind down, having a routine and being consistent. It works! Thanks Ros! Yes, having a routine is so helpful!